Christopher Willard, Psy. D., is one of the world's leading experts on mindfulness with young people, having trained thousands of professionals and young people on the practice and benefits of mindfulness. He is a psychologist and consultant based in Boston, working individually as well as consulting to schools, hospitals and other organizations. Additionally, he is the author of multiple books on psychology, child development, contemplative practice and more. Dr. Willard is the president of the Mindfulness in Education Network and serves on the board of directors at the Institute for Meditation and Psychotherapy. In addition to serving on the faculty of Harvard Medical School, Dr. Willard leads courses and workshops around the world and online. 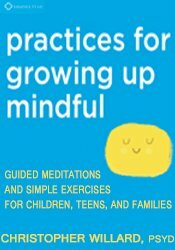 Dr. Willard is the co-author of The Mindfulness Skills Activity Book for Children (PESI, 2018), and the author of Child's Mind (Parallax Press, 2010), Growing Up Mindful (Sounds True, 2016) and numerous others. He is also the co-author of the bestselling Growing Mindful (PESI, 2015), Growing Mindful 2nd Edition (PESI, 2019), Growing Mindful Spanish Edition (PESI, 2016), Growing Happy (PESI, 2016), Mindful Reminders (PESI, 2016), The Self-Compassion (PESI, 2016) and Anti-Burnout (PESI, 2017) card decks. Financial: Christopher Willard maintains a private practice. He receives royalties as an author for New Harbinger Publishing, Guilford Press, and Parallax Press. Dr. Willard is the president of the Mindfulness in Education Network. He is on the board of directors at the Institute for Meditation and Psychotherapy and is faculty of Harvard Medical School. Dr. Willard receives a speaking honorarium from PESI, Inc. Non-financial: Christopher Willard has no relevant non-financial relationship to disclose.